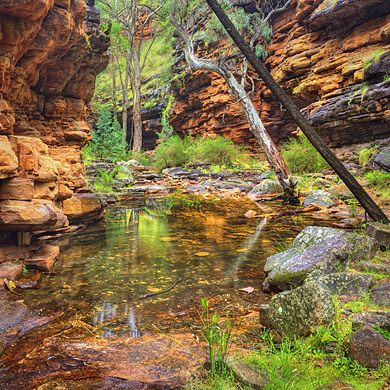 Close to Melrose is Mount Remarkable National Park and Alligator Gorge, recommended to me for a visit by some friends. A walk through the short gorge is a fascinating experience through history and geology. The angles in which these trees grow is another tribute to their adaptability in surviving. It was raining much of the day, but when it stopped, it provided the flat light which I was wanting in order to softly light this spot within the gorge and the stillness of the water required for the reflections.